Happy New Year!! A time to reflect and to remember! Happy New Year to all my blogging friends! I want to say Thank You to all the friends I have made this past year, and how much I am looking forward to 2011! I am so grateful for all that I have and all that I have been given and this is the perfect time for me to reflect on what a wonderful year it has been for myself and my family! I have so much enjoyed visiting all the blogs of my friends and it amazing how much you can learn from each other, make a connection with someone thousands of miles away and have so much fun! 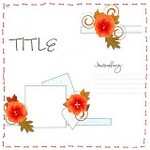 I look forward to another year of fun emails, awesome blog hops, fun challenges and lots of paper crafting fun! 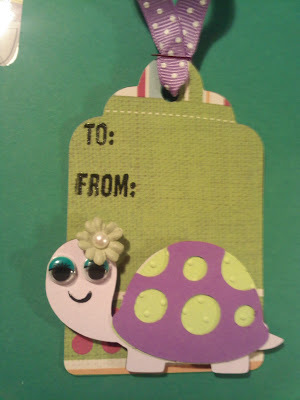 Here is the card I made for the celebration of 2011. We have a pretty big party with family, friends, food and games. Now this was supposed to be the ball that is dropped On New Year's Eve, but my Husband looked at it and said he didn't see that at all.... (HMMMMM he is so NOT crafty)Then little Meg came hopping in and said "cool New Years Ball Mom" then hopped away. So I'm not sure! I used the Wild Card to cut the window card and celebrate and Accent Essentials to cut the circles. I cut two of the layers to hide the string that is holding the ball. This day is always a day for me to remember my Dad. He unexpectedly passed away 1-1-00. Not a single day goes by that I don't think of him and all that he has missed. I am Thankful for the time we had, I am who I am today because of him and I truly am my Father's Daughter. Hey everyone!! 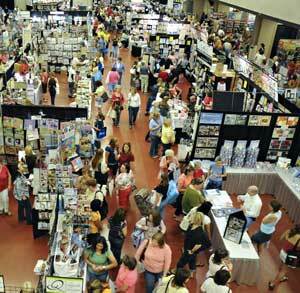 I just received an email, Creative Keepsakes Scrapbook Convention is coming to Mesa Arizona April 15 & 16th!! I have gone the last two years and can not wait to attend this year! Last year I took a full day of classes, this year I plan on just shopping! If you are planning to attend and want to meet up please contact me! I already have a list of Blogging friends that are going! Shopping, Eating, chatting, and fun! Thanks to Techniques by Trish Creative Scraps Challenge and Dorcas who sponsored it, I won the Country Life cartridge on the last challenge! And I have no project to show because I hit the after Christmas specials and I have run out of craft space! DCWV 70% off!! I bought the 180 paper pack for $5.99! This is only my third attempt at coloring an image, I have not been thrilled with the last ones, but I love how this one turned out! I am sending this to my sister, this is what she looked like when she was little! I used Eucalypptus Walnut spray ink. The background paper was white I used this spray to help it look nicer with the leaves from the flowers. Join the fun! Check out The Manic World of Mrs Weyremaster! I wanted to get one last challenge in! 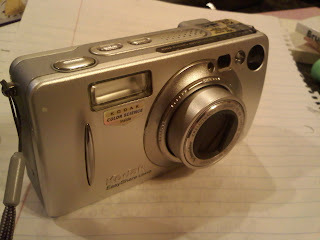 I am LOVING my new camera!! I have all this wonderful paper so I wanted to try some out. These are all from My Minds Eye. Letters are from Heidi Grace. 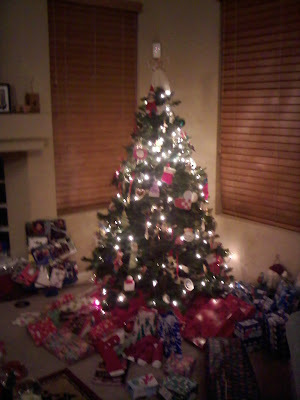 What an awesome Christmas!! We had a great day and it was a beautiful 77 degrees here so we were able to go outside and have some fun! The girls didn't wake up until 8:00 am which was great because I was up most the night! Here is a quick video of my Christmas haul! It cut off at the end but I wanted to continue to say I can't wait to go blog hopping and see all the goodies everyone received! As you can hear in the video I am so super excited! I would like to say thanks to all my followers! I really appreciate you stopping by to visit and I am looking forward to a great New Year! We had such a busy day today!! Drove around see see Christmas lights. And now I am just waiting for two little girls that had way to much sugar to fall asleep! So of course I have just a few moments to craft! Only an hour and a half before Santa arrives!! Merry Christmas!! I already have my turkey cooking in the oven so while I am sitting around waiting for it to cook I thought I would post the card I made last night! Two little chickies spilled the beans and told me Santa was bringing me a camera... hmmmm I think he got off easy this year since my camera broke just a few days ago! Tree is from Simply Charmed. Teal or BlueGreenBrown I hope everyone has a wonderful days and enjoys precious family time! My internet modem died yesterday!! So I was without internet for what seemed like forever! So I had plenty of time to officially put away all my Christmas crafts! And I had so much clean space I was super eager to make something "non" Christmas! I love how super sweet this is! Create A Critter for the piglet. Fantabulous Cricut: What are you creating this week? Now I am off to wrap, wrap, wrap! Some Thank You's and A Winner!! 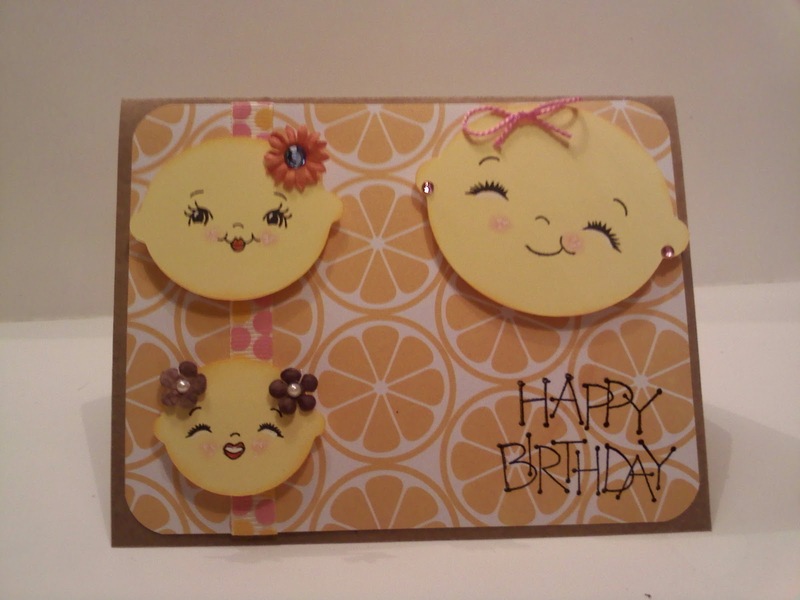 Thank you to everyone that hopped along with me for the Embellish me with Quilling Blog hop! 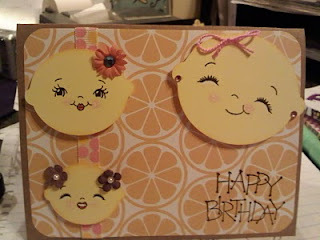 I hope you were inspired to try something new or get back to quilling! Congrats Jennifer!! Please email me! And thank you to Flaunt it Fridays! I won The Happy New Year Stamps!! And they are awesome!! and Thank you for Frosted Designs! I won the Purple Pumpkin Prize pack! and Thank you to Paula at More Than Favors! My chickie won a cricut marker set! 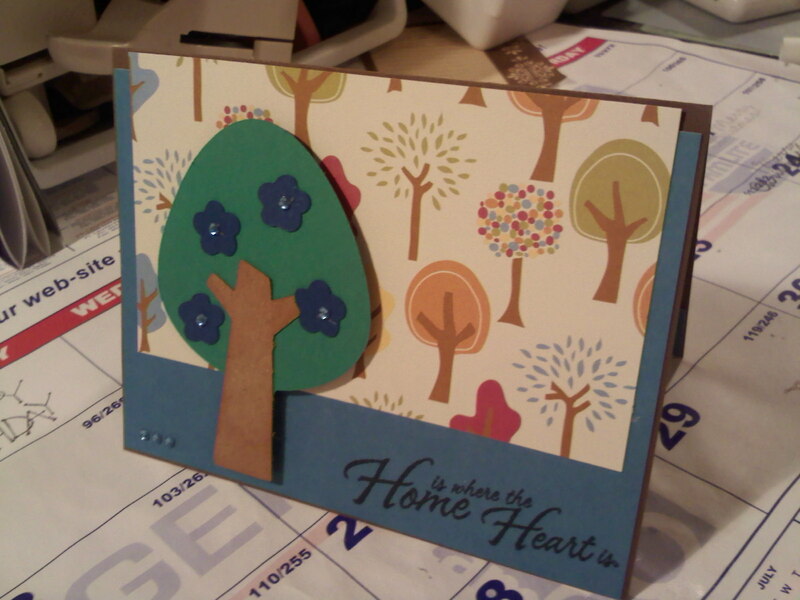 I made this card for my Mom's Birthday. My girls think she looks like this lemon when she laughs! The two little lemons are my chickies, the big one is my Mom! I think she will get a kick out of it! 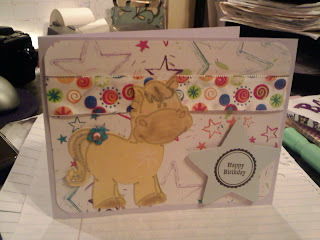 I'm not really happy with this card, I had a vision but this was not it! I did use my Gypsy (Yippee) because first I used Cricut markers to trace the horse then I hid all the cuts except the outline and then went back over and cut just the outline. I think I should have used different color paper for her and not so busy ribbon... anyways... here it is! MAG Challenge: On to this week's challenge #8! I think this will be my last Christmas project for the year! It is time for me to clean up my huge mess and get ready for the Christmas Holiday! I used Jolly Holiday for the Banner, Stocking and Wreath. Paper is from Tis the Season. Quilled pieces from Linda from My quilling nest. Stamps from Studio G. Mitten border from Martha Stewart.